Cute Brady the pup: "Why are these fish so hard to catch? " 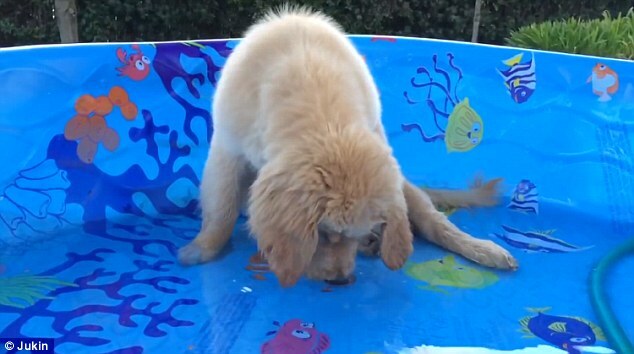 This is the heart-warming moment a puppy attempted to catch a fish - only to confuse itself by trying to bite the image of one printed on a paddling pool. Brady the Golden Retriever has become somewhat of an internet sensation following the footage, which first appeared on his YouTube channel. In the clip the puppy appears to be enjoying itself by splashing around in the Disney themed Finding Nemo paddling pool and wetting its muzzle. He then looks at the picture of Nemo staring back up at him from the bottom of the pool, and without giving it a second thought, attempts to bite it. Pulling his head back out of the water, Brady looks to be entirely confused by the whole episode but keeps the fish within its gaze. Responses to "Confused puppy tries to catch the fish printed on the bottom of his paddling pool"